Introducing The Breakout Tour, featuring today's hottest up and coming heavy metal and rock bands from the U.S. Northeast! 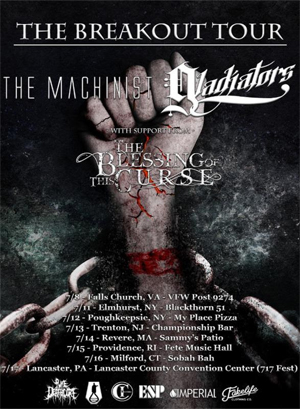 Presented by Pure Deathcore, Deathkrew Clothing, CI Records, ESP Guitars, Imperial Cymbals and Fakelife Clothing Co., the tour will feature performances from New York City's THE MACHINIST and Lancaster, PA's GLADIATORS, with support from New Jersey's THE BLESSING OF THIS CURSE. Each of these artists have received great recognition in their local scenes - demonstrating strong instrumentalism and striking live performances - and are poised to breakout into national stardom. "The Breakout Tour" will visit a total of eight Northeastern U.S. cities next month, beginning on July 8 in Falls Church, VA and will hit venues in New York, New Jersey, Massachusetts, Rhode Island and Connecticut before ending in Lancaster, PA on July 17 at 717 Fest. See below for all currently confirmed tour dates and more information on each band. THE MACHINIST is a four-piece metal band hailing from all corners of Queens, NY and abide by one goal: to bring the groove to all. With catchy riffs, grooving breakdowns and the shred we all love, THE MACHINIST has a little something for everyone... and then some. The band's debut release, The Machinist EP (out July 8 and available on tour), was recorded at Westfall Studios with Anthony Lopardo and is available to pre-order via the band's BigCartel page. Featuring lead vocalist Amanda Gjelaj - who's demonic growls and screeches would put any metal vocalist to shame - The Machinist EP will appeal to fans of groove metal like LAMB OF GOD, as well as fans of emotive melodic groups such as MISERY SIGNALS. GLADIATORS is a rising progressive metal band from Lancaster, PA. Lancaster is a culture hub that within the last decade has become recognized for its vibrant music scene exclusive to the region. While Lancaster-native artists like AUGUST BURNS RED, TEXAS IN JULY and THIS OR THE APOCALYPSE have made a strong name for themselves in the metal scene, GLADIATORS works tirelessly to set themselves apart and establish a new frontier in the genre. The band brings a fresh perspective and direction to a scene that has developed a specific sound. THE BLESSING OF THIS CURSE is a five-piece metalcore band based out of Bergen County, New Jersey. Their most recent release, Emergence EP, is available now on iTunes and all other digital music providers! Featuring the singles "Quicksand" & "Unconditional", this latest effort by TBOTC showcases their ability to blend technicality, brutality, and melody in a unique, cohesive way. This EP was recorded with Steve Seid and mastered by Will Putney at Graphic Nature Audio. Since their inception in 2011, THE BLESSING OF THIS CURSE has made it their goal to create honest, heavy music that stands out from the rest. Although their sound has changed and progressed over the last few years, this goal has stayed constant. After gaining traction with their sophomore release Separate Yourself, they have been given the opportunity to share the stage with national acts such as MOTIONLESS IN WHITE, THE WORD ALIVE, UPON A BURNING BODY, VEIL OF MAYA, THY ART IS MURDER, I SEE STARS, and more.